Campbell, W. Joseph and Coward, John. 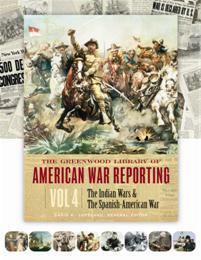 The Greenwood Library of American War Reporting: Volume 4, The Indian Wars & amp;The Spanish-American War. Greenwood, 2005. ABC-CLIO, publisher.abc-clio.com/9780313395390.